Ireland – The Redemptoris Mater Archdiocesan Missionary Seminary in the Archdiocese of Armagh, Ireland, was founded in 2012 by Cardinal Sean Brady, Archbishop Emeritus of Armagh, to form priests who are both diocesan and missionary for what is known as the New Evangelisation. Archbishop Eamon Martin, Archbishop of Armagh and Primate of All Ireland, recently presided at the official opening of the Seminary’s new premises, the former De la Salle brothers’ residence in De La Salle Terrace, Dundalk. 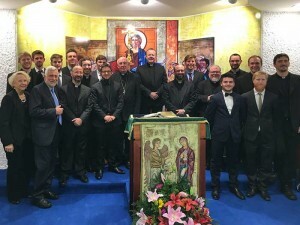 The buildings have been completely refurbished to provide housing, worship and study areas for the sixteen young priests from eight different countries currently in training. While the Seminary is based in Dundalk, celebrations and meetings take place all over Ireland and involve people and volunteers from all over the world. As a result, the Seminary decided to invest in a portable simultaneous translation system to improve communication in multilingual environments. After evaluating a number of different systems and brands, the Seminary’s technical advisory team finally decided on MIPRO as the optimum solution for their needs. The equipment was supplied by AV integrations specialists AVworx in Bedford via MIPRO’s UK distributor, CUK Audio. “We wanted something that was compact, reliable and portable as we have meetings all over Ireland involving people from many different nationalities,” explained Nicola Ondei who is himself Italian and advised the Seminary on their technical needs. Redemptoris Mater’s system comprises three MTS-100 digital wireless 16-channel transmitters that are based in the main building at De La Salle, four MTG-100T ultra-compact portable transmitters for the meeting leaders/speakers and 35 MTG-100R portable receivers for participants along with the requisite dedicated storage and charging cases for outdoor or remote celebrations.